Home > Types of Freelance Work > What is Freelance Writing? “Freelance writing” is a broad term that can cause confusion if others don’t understand what it truly means. While there is no official definition of freelance writing, in general it is recognised that freelance writing is any form of writing that is completed on a contractual or per-project basis. It is not so much the type of writing completed as the business arrangement that makes a form of writing truly freelance. Freelance writing can encompass almost any kind of writing. Magazine articles, books, short stories, poems, greeting card text, copywriting, slogans and website text are all common types of freelance writing. 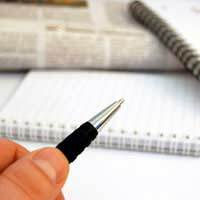 Writing for corporations, organisational newsletters, television programmes, radio programmes and blogs are also avenues for professional freelance writers. In essence, any type of writing that is contracted and completed on a project by project basis, regardless of what rights are sold for the writing, can usually be considered freelance writing. When the terms “freelance writing” and “freelance writer” come up, many people immediately think of writers working from home in their pyjamas. In fact, the location of the writing has nothing to do with whether or not the work can be considered freelance. Freelance writing can be carried out on-site (at the employer’s premises) or off-site (not at the employer’s premises), but it is the arrangement between the freelance writer and his or her client that decides if the work is freelance or not. If a writer is not required to be on-site for the duration of the project then freelance writing can take place almost anywhere – at home, on the road, in a café, in a library or just about anywhere else. Freelance writing is negotiated on a contractual basis, which means that the freelance writer and his or her client make a new contract for each project that the freelance writer undertakes. This contract should always include details of the project, the deadline for the project and the payment terms for the project. These payment terms should detail not only the amount of money that the freelancer will receive for the project, but when the freelancer can expect it. Payment made on acceptance of the project, on publication of the project, or on a certain number of days after these terms are common payment schedules for freelance writers. Freelance writers might also be able to negotiate for partial payment up front, to receive an advance or a cut of royalties, or to receive a “kill fee” if they complete a project that ultimately does not get published. Freelance writing is a career that depends upon selling writing on a contractual, per-project basis. This writing can be on almost any topic, in any style or any structure, and it can be carried out at almost any location. It is the business arrangement regarding the sale of this writing that defines freelance writing, and payments for freelance writing can vary widely. A freelancer should therefore always make sure that (s)he has a contract regarding the writing project and that this contract clearly stipulates the payment and payment terms related to each new freelance writing project.